My parents and I have been collecting these Missouri made baskets for 25 years now. 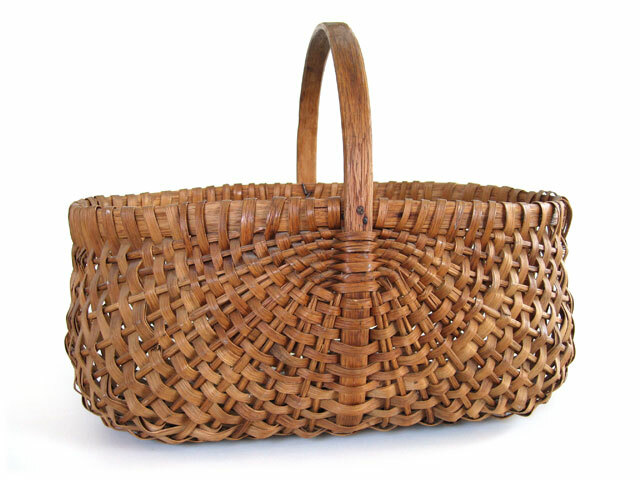 They are made by the Westfall family and are on at least their 5th generation of white oak basket making. All of their baskets are constructed using a very unique style of ribbed construction. They use a combination of what they call "long spokes" and "short spokes". If you notice in the photo they do not use a typical Appalachian "ear" or god's eye where sharpened spokes are inserted at the junction of the rim and handle. They use long round spokes that are bound to the frame as the first rows of weaving are began. These oval baskets are relatively easy to find as are the round baskets they made all in different standardized sizes. This 12" x 18" x 14" tall basket would have been called a "1/2 bushel oblong". Yes I failed to mention that all of their baskets are made of white oak.